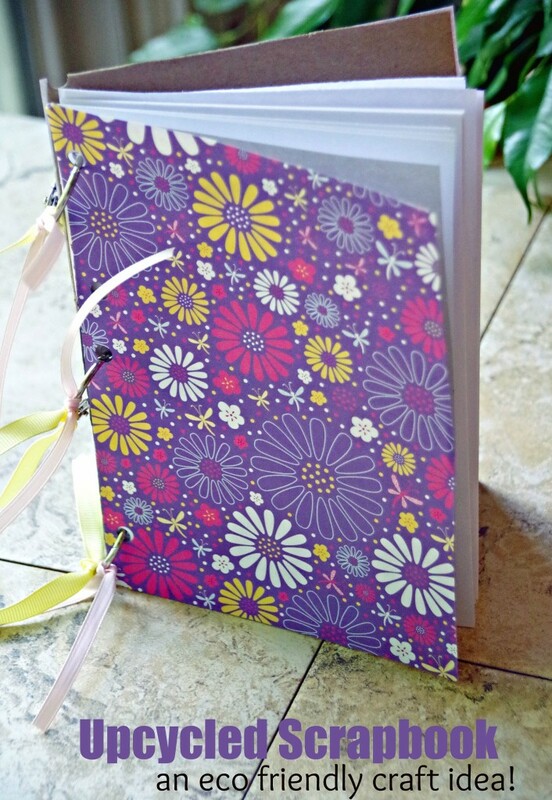 Home » Crafts and DIY » Crafts » Easy Upcycled Scrapbook Makes Box Top Collecting Easy! Easy Upcycled Scrapbook Makes Box Top Collecting Easy! 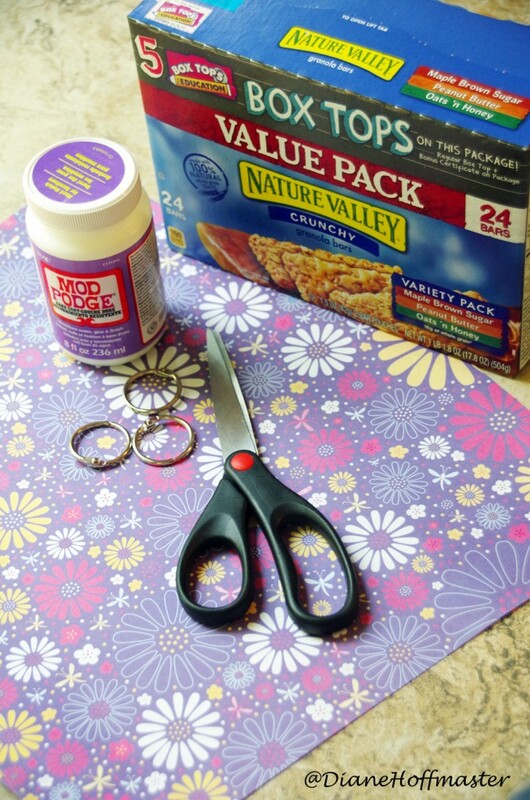 This upcycled scrapbook craft is part of a sponsored conversation written by me on behalf of General Mills®. The opinions and text are all mine. During the course of my very chaotic day, I have a tendency to lose things. No matter how hard I try to keep track of STUFF, it ends up missing more often than not. My husband wonders why I never answer my cell phone. Most likely because I have left it in a bathroom and can’t hear it when it rings. My glasses have gone missing repeatedly…usually to be found after minutes of searching sitting on top of my head. Is it just me? Do you find yourself dealing with ‘mom brain’ and wondering where you left your sweatshirt? After days of searching, I just found mine in my gym bag this morning! So, when my daughter told me that a Box Tops for Education collection campaign was starting at her school next month, I knew I needed to find a good way to keep track of those tiny little things! This easy upcycled scrapbook makes Box Top collecting easy and you won’t forget where you put them when your child’s teacher asks for them! For this upcycled scapbook project, I am using a large box of granola bars that I bought on my recent trip to Walmart. This is one of the limited double Box Tops products that you can purchase to help raise money for your child’s school. 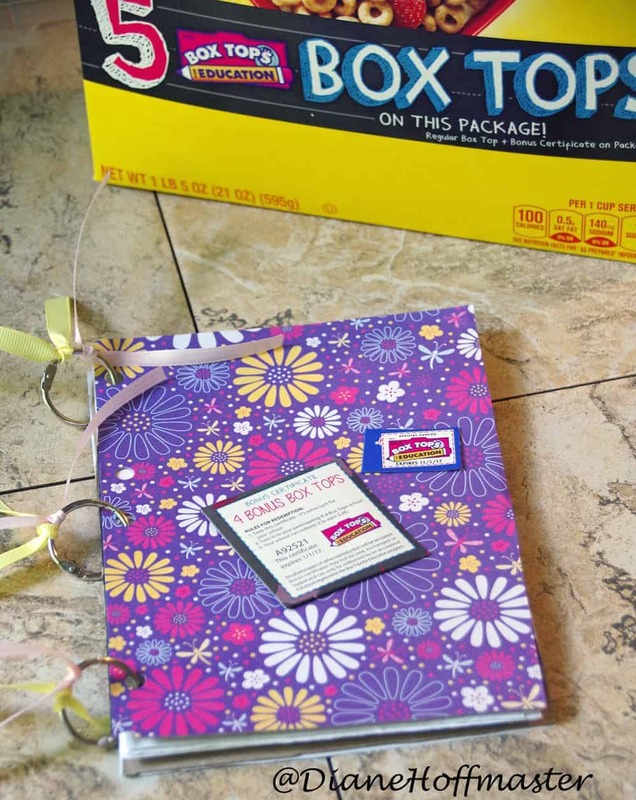 If you aren’t familiar with the Box Tops for Education program, check out my recent post (INSERT LINK HERE) for more information. You will find a nice variety of items that you use every day that will help raise money for your child’s school. The first thing you need to do to create your upcycled scrapbook is to cut your selected box to the right size. I found that using the front and back panel of the granola bar box gave me two pieces of cardboard that were approximately the right size. The next thing you want to do is cover your cardboard pieces with pretty scrapbook paper. Use something that inspires your child so they get excited about their Box Tops for Education collecting. Cut the paper to the correct size and add a small amount of Mod Podge to the picture side of the cardboard. Lay your scrapbook paper over the Mod Podge and let dry. 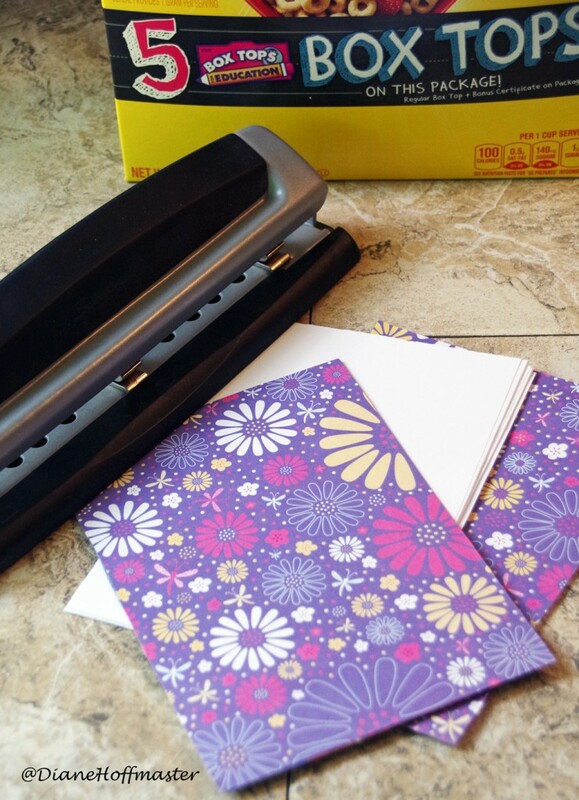 Trim off any excess paper so you have two colorful pieces of cardboard…one front, one back! The next step will require your hole punch. Cut white printer paper the size you need to fit inside your upcycled scrapbook. 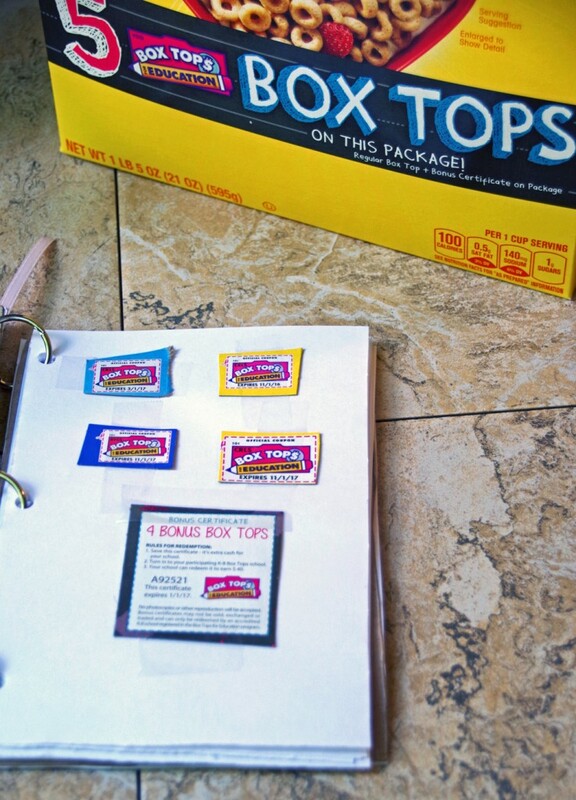 Box Tops for Education are not always a standard size so I like to leave the pages blank to give kids plenty of room to tape them on each page. Punch three holes in the paper, as well as in the cardboard pieces themselves. Your entire upcycled scrapbook will be held together with loose leaf binder rings. You can use 2 or 3 depending on how large you chose to make it. Next, attach a few pretty ribbons to your binder rings to give your eco friendly craft a bit of pizzazz! Voila! You now have an easy way to collect Box Tops for Education without losing them before the collection date at your child’s school! There are a ton of products at Walmart that will help raise money for the Box Tops program. Items you use every single day probably have Box Tops on them and you didn’t even know it. 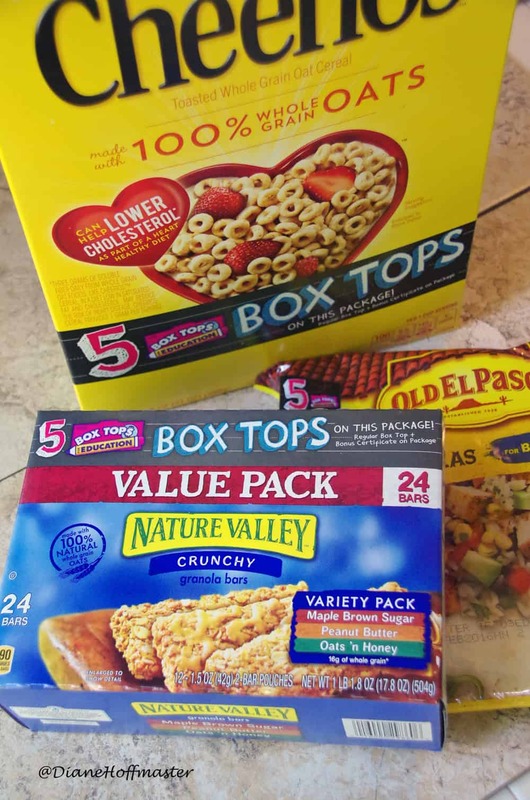 Right now, Walmart has a Bonus Box Tops offer on select General Mills® products so head over and do some shopping! 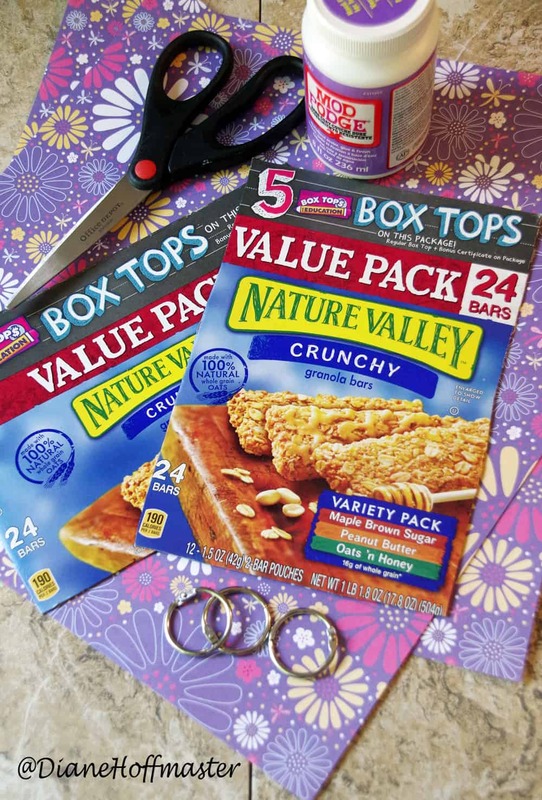 Do you collect Box Tops for Education for YOUR child’s school? This is a sponsored conversation written by me on behalf of General Mills®. The opinions and text are all mine. Huh! I would never have thought of that. Beats the ziplock baggies we use! This scrapbook is so cute!!! I love how it keeps everything in one spot and hard to miss place one.